As a home owner, you’re probably always looking for ways to improve your home and make it an even better place to live. Well, we’ve found a super easy way to DIY your way to a homier backyard. An outdoor lamp can make your landscape feel cozier and add a little class to any outdoor event. It’s easy to turn a landscape light into a fabulous outdoor lamp. First, use your scissors to remove the cord from the lamp base. You can cut the cord at the bottom of the lamp, unscrew the socket at the top of the lamp, and then pull through. Once you’ve done that, be sure to cut off the cord from the base of the socket and screw the socket back into the lamp. Now that the cord is removed, add the lamp shade to your lamp base, ensuring that the wire socket frame is snug on the socket. Place the landscape light — no need to use the plastic spike here — into the socket, adding padding around the light if needed to achieve a snug fit. Depending on the power of landscape lighting you use, this lamp may provide a subtle light perfect for outdoor parties or a brighter light made for illuminating your outdoor spaces. That’s it! This DIY outdoor lamp is so easy to put together and can turn your backyard into a chic outdoor space in no time. This cute lamp is perfect for areas where you need a little more subdued landscape lighting, such as on a side table next to chairs or any other space made for relaxing. Have you tried any home improvement crafts to improve your backyard? Let us know about them in the comments below! As summer fades away, so do those precious daylight hours. That doesn’t mean that your home improvement or outdoor projects can come to a standstill. For this month’s product spotlight, we share the EcoZone LED Work Light from Coleman Cable, the perfect portable LED lamp for your household needs. Bring your work lamp with you into your attic, crawl spaces, work sheds, or anywhere that you might have difficulty dragging an extension cord for your temporary lights. With 800 lumens (about 60 watts) of high-output, mirror-reflected bright light, this is an ideal lightweight rechargeable aid for any small working space. Unlike comparable halogen models, no heat radiates from the lamp. This means that you will not accidentally scorch yourself on a hot surface or be driven out of an overheated room when bringing it into harder to reach and smaller spaces. Take the EcoZone with you anywhere thanks to the padded grip handle and the non-skid feet will ensure that it will stay put while you work. The rugged construction also makes it extremely durable for all environments. 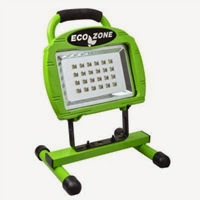 Offered at an affordable $79.50, conveniently brighten up those hard to reach or outdoor areas with the EcoZone LED work lamp. So as the days get shorter, don’t worry about rushing home from work or missing family activities on the weekend to work on your important projects. With the reliability of the Coleman Cable name, we guarantee that this is one tool you will be happy to have on hand when working on any home do-it-yourself project.